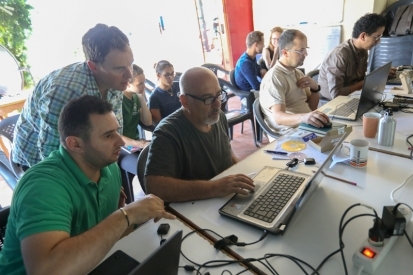 The “ACCOBAMS Survey Initiative” (ASI) aims to establish an integrated and coordinated cetacean monitoring system in the Mediterranean and the Black Sea. The objective of acquiring knowledge comes together with a strong will of providing capacity building for scientists and national experts. The project also contributes to improving regional cooperation efforts, a key success factor in cetacean conservation. In this context, the first cetacean large-scale survey will be carried out during the summer of 2018 throughout the whole Mediterranean Sea, combining visual observation methods (from aircrafts and ships) and passive acoustic monitoring, with the participation of scientists from the region. Since not all riparian countries of the ACCOBAMS will be able to carry out their survey using airplanes, a special training was set up (as part of the training and capacity building component of the ASI project) for these countries to train their Cruise Leaders in using a similar protocol onboard boats and marine vessels instead of planes. The workshop is taking place in the Island of Samos in Greece from the 18th to the 23rd of June 2018. Participants from Egypt, Lebanon, Libya and Syria are involved in the training in both theoretical and practical sessions. In turn, these Cruise Leaders will afterword train the observers in their respective countries to prepare them for the survey and to supervise its running.